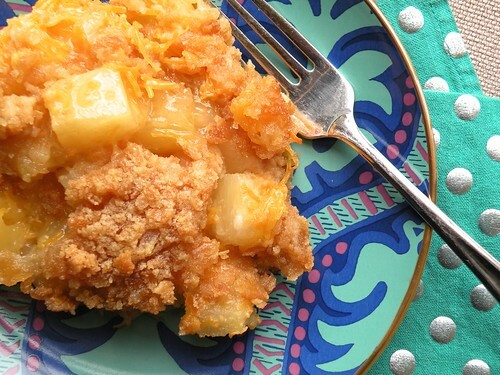 We’re rounding out our Casserole Series today with a fabulous sweet and savory casserole that is a southern favorite. It’s got the sweet richness of pineapple with the sharp tang of cheddar cheese with a buttery crumble on top. This is ideal for a picnic or potluck since it is just as tasty at room temperature as it is warm out of the oven next to a slice of ham. You could also take it in a spicy direction by adding a pinch of red pepper flakes to the pineapple mixture and a few more to the crumble top. Try it out and make it your own! Preheat oven to 350 degrees. Grease a medium-sized casserole dish with the butter, then melt the rest of the stick and set aside. In a large bowl, stir the sugar and flour together, then add the drained pineapple and cheese. Stir until well combined and transfer to the prepared casserole dish. In a separate bowl, stir the crushed crackers, melted butter and reserved pineapple juice together to create a crumble. Spread the crumble evenly over the pineapple and bake for 30-35 minutes, or until golden brown on top and bubbly around the sides. Serve warm or at room temperature. ← Small Cookies, Big News: Nibblers Cookies Are Coming to a Grocery Store Near You!